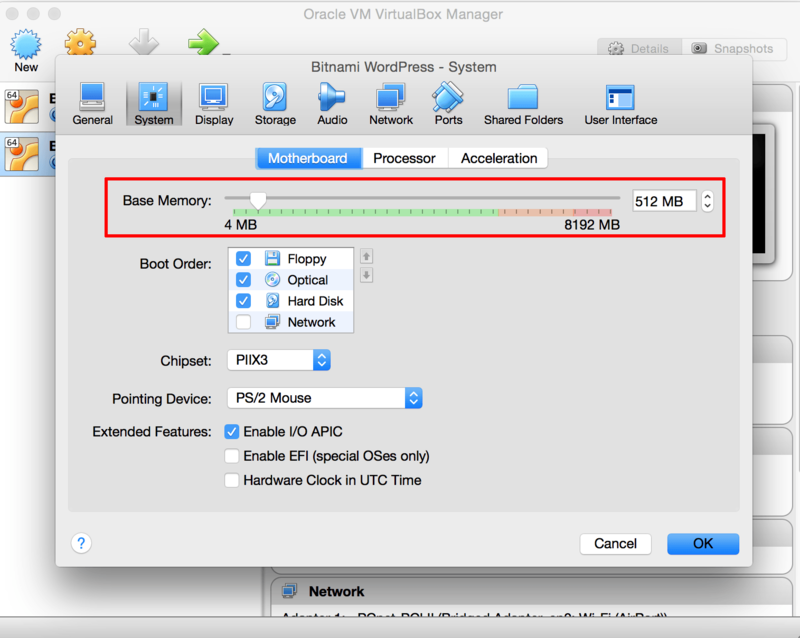 Recent versions of Bitnami virtual machines include the PAE kernel, which allows you to increase assigned RAM memory to more than 4 GB. The optimal setting will also depend on the host machine’s capabilities and the number of virtual machines running simultaneously. TIP: It’s good practice to share the RAM between the host machine and the virtual machine. For example, if the host machine has 2 GB RAM and you are only running one virtual machine, increase the RAM of the virtual machine to 1 GB. It is not advisable to increase it to more than this because this may result in the host machine running out of physical memory and switching to swap memory, which significantly decreases overall performance.